Finally after me telling stories of finding treasures and other people finding treasures my friend broke down and bought a new Garrett AT Pro. I told him that I would take him to some places to practice because the best way to find things is to learn your machine. After a few runs around some yards he started understanding what I was talking about. 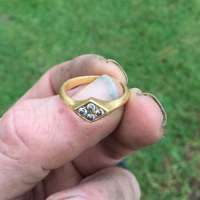 Well we were doing some volunteer work and I remembered back in 1988 a Doctor had called me to come find his ring he had lost and it was insured for $14,000 dollars. I looked for several weeks off and on with my old Treasure Hawk metal detector but never found it. So we break out his detector and started searching. He found a women's makeup case top that said Pampeian Bloom with an art deco decoration around the edge. I told him that was a cool find, probably from the 20’s. Well this got us both excited about the site. So a day later he is calling to go back after work so I got out my Garrett 1500 and we started hitting the area hard. We found lots of trash and coins none really old but after talking to my brother-in-law about our finds he was wanting to go. My brother-in-law and I used to go several times a month till our elderly parents needed us more and took up our free time. I told him we were going back that afternoon if he wanted to come so he broke out his Whites MXT and away we went. We start pounding the area hard looking for the ring but after 2 hours all we had were some clad and lots of old pull tabs and trash. We were determined to clean out area but my brother-in-law’s MXT started acting up on him so he decided to leave. I ran over a quarter and called my friend over to see what his AT Pro said it was. He comes up with a quarter too, so I told him to dig it since he had been getting mostly pennies. He said but you found it and I told him I wasn’t going to dig it so go on and dig it. 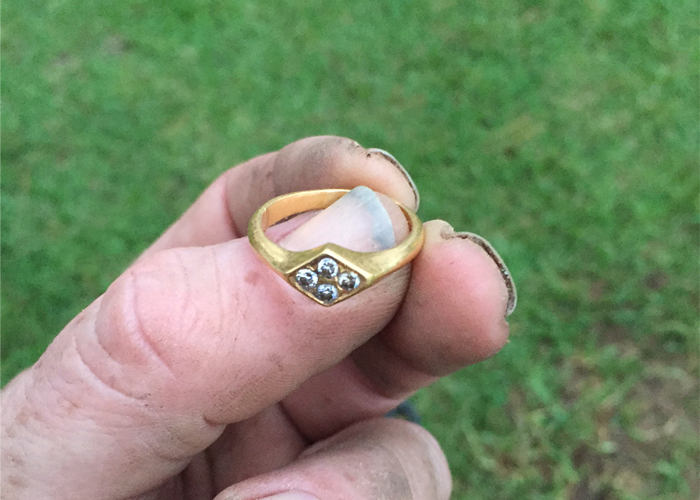 As I walked away from him I got another Gold Ring / Pull Tag tone I already had over 13 pull tags but I decides to go on and dig it to clean the area out. Boy was I glad I did because when the plug came out I’m hit with the reflecting of Gold and when I pull it out, the diamonds are just sparkling. First thing I did was call my brother-in-law who wasn’t that far away to tell him to come back. He knew I had found a ring but was it the ring? Well, took it to a jeweler. It's a custom made 22 Karat gold ring with the four very clear diamonds that add up to ½ a karat. There is no way it was worth $14,000 back in 1988. We hit the spot several more times but never found the ring but I was very happy with the one I found. I will soon put it up for sale and split profits with my hunting buddies. My Brother-in –law and I are looking at buying Garrett's new carrot pin pointer. Thanks Kellyco all machines used in this story were purchased at Kellyco. It has also fired up my friend. He has gotten better and sometimes finds more coins than I do. I did end up finding a Indian head right next to a 1918 Wheatie.